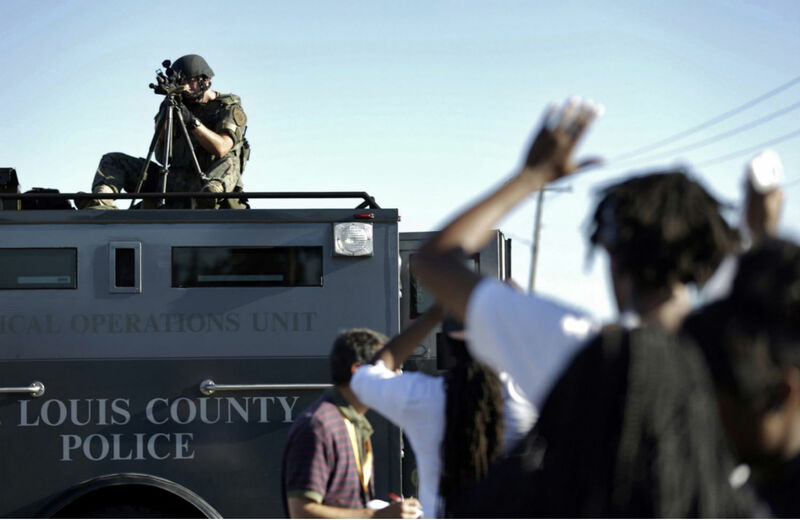 Will DOJ Intervention Improve Policing in Ferguson? There’s debate over whether federal government involvement will make a difference in Ferguson. Cincinnati, site of a police shooting in 2002, offers clues on how to address racially biased policing. In 2002 I moved back to my hometown, Cincinnati, for a few years. I was drawn in part by activism there in the wake of the police shooting of a 19-year-old black teenager named Timothy Thomas and subsequent riots. The outrage and sense that real change was possible were strong, as I imagine they’ve been in Ferguson, Missouri, since Darren Wilson killed Michael Brown there last month. Cincinnati has been in the news lately for exactly this reason, drawing comparisons to Ferguson at The Washington Post, The New Republic and elsewhere. The upshot seems to be that Cincinnati emerged from the upheaval of April 2001 with improved police-community relations and that Ferguson’s residents can look there for guidance on how to move forward. Among the evidence that’s been offered to support this claim: in the six years leading up Cincinnati’s pivotal shooting, fifteen men—all of whom were black—died at the hands of police. In the ten years since, eight men have been killed by police, six of whom were black. Those involved in Cincinnati’s reforms point to two developments that have led to the drop in police killings and what they say is an increase residents’ trust of police: (1) The Department of Justice investigation and subsequent “consent decree,” that is, a settlement between the city’s police department and the federal agency; and (2) the Collaborative Agreement, a document—negotiated and agreed to by city government, local activists and the police union—that led to reforms such as improving police training, setting up a civilian complaint board and equipping police with tasers with the expectation that they would then be less likely to use lethal force. It’s the blueprint that figures in heavily with what Cincinnati organizers have offered Ferguson in recent weeks. The people of Ferguson have already secured Justice Department involvement. Last week, Attorney General Eric Holder announced his agency’s intention to examine whether there’s a pattern and practice of racially discriminatory policing and civil rights violations in Ferguson. Already, there’s debate about how meaningful the federal government’s involvement can be. During a recent segment of Melissa Harris-Perry’s show, guest Phillip Atiba Goff put the onus squarely on city officials, arguing that a consent decree is “really a lever for progressive law enforcement that wants to do the right thing.” In other words, if city leadership is resistant, it’s a safe bet that no substantive change will result. Thomas Streicher, the former Cincinnati police chief, said his city’s consent decree transformed the way the department analyzed police shootings. Police began to look not only at whether they were justified in shooting, but whether officers could have used less-deadly tactics. “Instead of creating a condition where police have to use force, create a condition that eradicates the need to use force,” Streicher said. People who were involved with the Cincinnati agreement insist that Department of Justice monitoring is crucial. Federal oversight kept opposing sides at the table in the early days of negotiations. “A lot of it was forced, initially,” said Robin Engel, who heads the Institute of Crime Science at the University of Cincinnati and helped police implement reforms. Cincinnati has seen changes in how police approach the community. A civilian complaint board was established in 2002 to independently investigate allegations of misconduct. Cameras have been placed in squad cards. The foot pursuit policy has changed, requiring officers to consider whether chasing a suspect makes sense given the seriousness of the offense. Officers who shoot civilians are immediately named publicly. That’s not to say that all is rosy in my hometown, and listing improvements isn’t meant to imply that Ferguson should adopt some one-size-fits-all approach to addressing racial bias in policing. There isn’t one. But as we continue to pay attention to the demands made and victories secured by Missouri activists and the commitments national organizers are making to building on the movement there, it’s worth reflecting on lessons learned a decade ago in another Midwestern city. Dani McClainTwitterDani McClain is a contributing writer for The Nation.